With deep regret, Sutton Falcons announce the sudden death today, of former member and clubroom stalwart, Barrie Greaves. 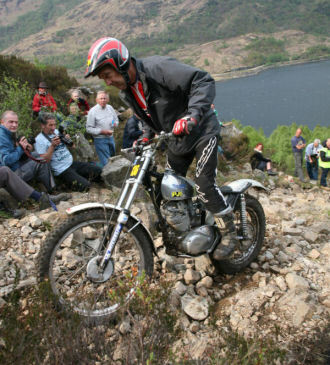 Barrie was instrumental in the introduction of the youth trials scene in the seventies and eighties. Barrie would have been 75 this coming Sunday. Unfortunately, the previously planned trial that was due to that place on Jan 25th has been cancelled. The weather in Teversal had been quite kind to the Falcons in the three weeks up to Christmas, bone dry on the Sunday when the trial was set out for Boxing Day. But then on Cristmas day night there was a deep frost, so a white over Norwood welcomed the 43 riders who turned up to blow away the christmas over indulgence. The frost brought the moisture to the top, so a nice slippy top layer made things very interesting. Richard Timperley led the pack on the hard route and gave them all a lesson in mud technique on the brand new John Shirt 300 Gas Gas, sounding as crisp as a new £50 note! On the clubman route, Dad Mark Timperley put his new Beta 300 through its paces to to good effect as well, beating nearest rival Col Bowers jnr on the very difficult 4th section in the stream gulley, Mark keeping tight for 5, whilst Colin had 11. Local mud maestro Dave Thorpe nipped in for third place, just having a few more slack dabs than the two top placed men. 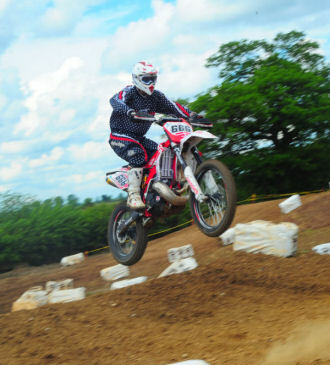 The easy route was won by local Roger Bown who employed his secret weapon of riding at the rear of the entry, which paid dividends with a lot of sections cleaned, with just a few dabs here and there on the rest.Nearest rival was young Ryan Bowers making a welcome return to the sport, once again section4 losing him the top accolade. The trial was followed by the clubs annual awards presentation at the nearby Carnarvon arms, with hot food and awards aplenty, and just after everyone had departed for home, the heavens opened up and within the hour, Teversal was 6'' deep in snow, and isolated, talk about a near miss ! !